Follow our Pupdates page to learn what the named lobo pups are up to in the wild. Children across the Southwest participate in our pup naming contest every year, and they’ve given unique names to every wild-born Mexican gray wolf since 2013. After naming, we keep track of the pups as they grow up, move out, and partner with mates. The numbers you see in the Pupdates are unique numbers assigned to each Mexican gray wolf born in captivity and to each wolf born, captured, and collared in the wild. 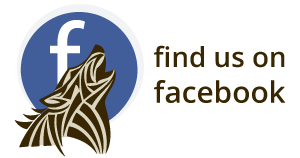 These numbers are important to scientists keeping track of the Mexican gray wolves. 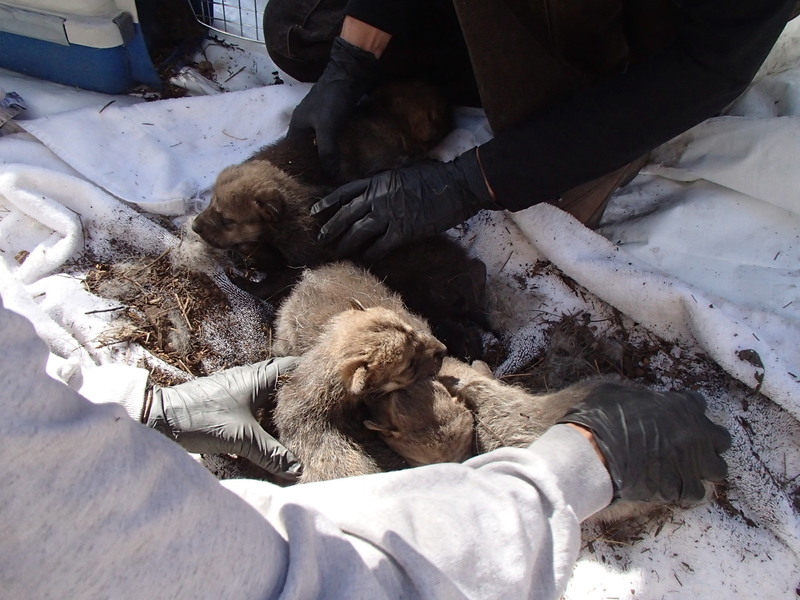 In 2014 Mexican wolf reintroduction project personnel were faced with a problem. Ernesta (AF1126), a captive born female wolf had been paired with a wild born male and released into the wild shortly before she was ready to give birth. Unfortunately, the pair was apparently not well bonded. The male left the pregnant female behind to have her pups alone. Fearing that she would be unable to provide for herself and the pups, members of the interagency field team captured the female and puppies. She was later re-released with a different male wolf and four of her six pups. The other two pups were placed into the den of the Dark Canyon Pack along with the Dark Canyon Pack’s own three pups, a process called cross-fostering. The field team hoped that the cross-fostered pups might survive and contribute their genes to the wild population. One of those tiny pups, who were only a few days old, with eyes still closed, when they were placed in the Dark Canyon Den, was little male pup, mp1347. In order to make sure the mother wolf would accept the two new pups as her own, mp1347 and his sister, fp1346, were mingled with the Dark Canyon pups before all the pups were placed together into the den. Dark Canyon and foster pups being mingled together outside the Dark Canyon den on May 15, 2014. Photo courtesy of USFWS. Little mp1347 received the name “Essential,” which was suggested by Morgan M. in the 2014 pup naming contest. He grew up in the Dark Canyon Pack, learning how to hunt and kill elk and deer for food, how to travel in the forest and grassland unseen, and other skills necessary for a young wolf to survive in the wild. During the annual survey of Mexican gray wolf numbers in February 2015, mp1347 was captured, examined, given shots to prevent common canine diseases, and fitted with a radio collar. Now it was possible to track his movements. Throughout the rest of 2015, Essential (m1347), now a yearling wolf, remained with the Dark Canyon Pack, helping to raise a new family, including a younger sister, fp1444. In February 2016 Essential (m1347) began making dispersal movements away from the territory of the Dark Canyon Pack. His travels took him over sixty miles to the west, until he found what he was searching for—a mate. 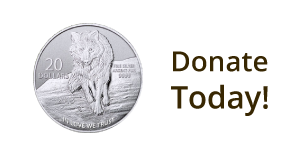 He was found traveling in Arizona with a female wolf from the Tsay O Ah Pack, f1445, who had received the name “Libre,” suggested by Eleanor Wilhelm in the 2015 pup naming contest. Essential and Libre appear to have settled down in the vicinity of Mt. Baldy, a mountain sacred to the White Mountain Apache Tribe. The mountain lies on the boundary between the Apache National Forest and the tribe’s Fort Apache Indian Reservation. They have been given the name of Baldy Pack in honor of their choice of a home range. Sunset over Mt. Baldy, October 28, 2016. Photo by Jean Ossorio. We’ll be watching for news of the Baldy Pack during the winter. By spring, Libre will be two years old and ready to have pups of her own. Perhaps some of our readers will select the names chosen for her pups!